The fun is over. 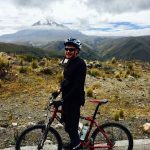 Tomorrow the serious business of cycling up Chimborazo begins. Our aim is to cycle from sea level then climb to the summit, with a bit of hiking in between. I have no illusions. It’s going to be tough, our buttocks will be pounded like raw meat at the butcher’s, and Edita will be hearing many profanities spewing from my mouth over the next few days. But we’ve just got to get on with it, and pedal like our lives depend on it. We’ve now been in Ecuador for a week. We’ve had some interesting hikes and are well acclimatised. 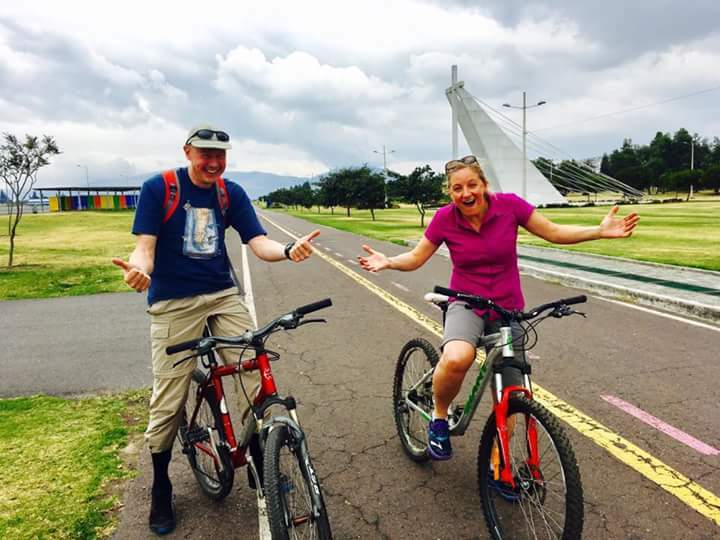 We tried out the bikes we will be using for our adventure on the runway of Quito’s old airport, which is now a bike park. Then we started with an old favourite. 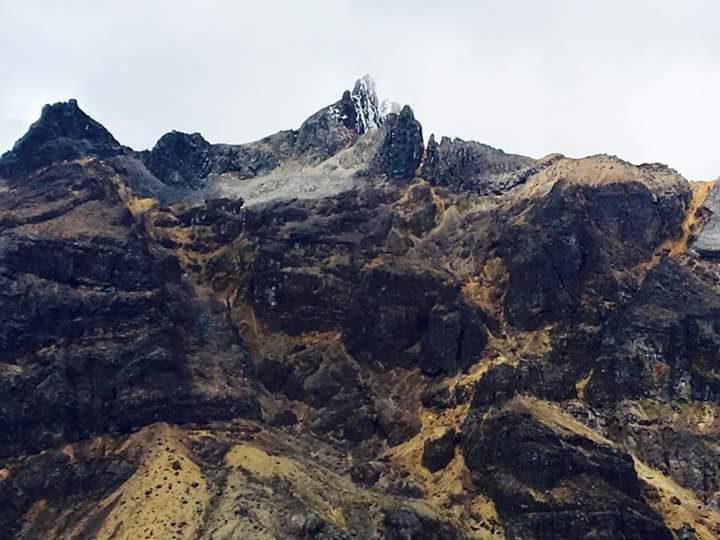 Rucu Pichincha is the volcano that rises to 4680m above Quito. Edita and I have both climbed it before, on previous visits to Ecuador. The route is quite straightforward and we climbed it on our own from the top of the cable car that ascends to 4100m. As with my previous visit, it was cloudy on the summit and we could see nothing of the amazing volcanic skyline that makes Ecuador’s central highlands such a treat. At least this gave me a chance to repeat the old joke that people all over the world like to use in these situations. After the eight Munros and four Corbetts that I took Edita up last month, she knew what I meant. The next day we went north to climb 4944m Cotacachi, the most northerly of the big volcanoes, which rises above the town of Otavalo. 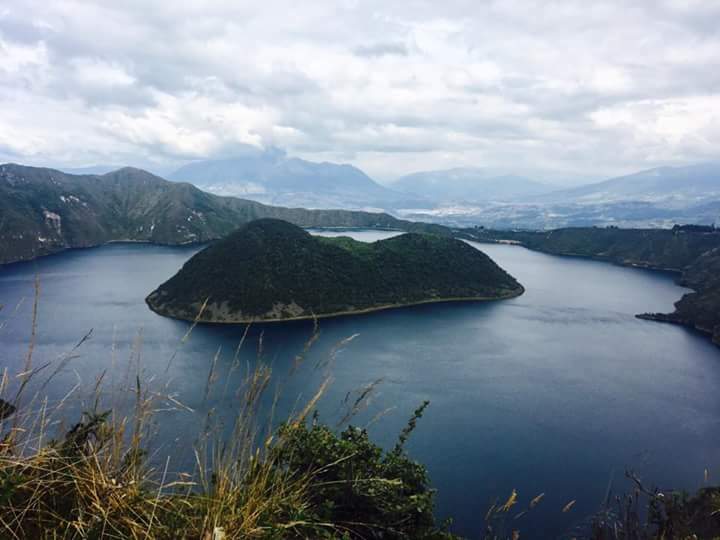 At the foot of Cotacachi is an interesting deep-blue crater lake, Cuicocha, which translates as the Guinea Pig Lake. The name comes from one of a pair of islands floating in the centre, one of which is supposed to look like a guinea pig, depending on what you’ve been smoking. 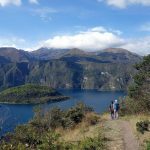 There is a beautiful five-hour hike around the rim of the lake, which we completed as part of our acclimatisation. Cuicocha, or the Guinea Pig Lake. The island looks like a guinea pig if you look at it from a certain angle and concentrate hard (Photo: Edita Nichols). Cotacachi is an intricate mountain with many ridges and couloirs that make for tricky navigation. To make things harder, it is frequently wreathed in cloud, and climbed so infrequently that it’s said that only one man knows the route. This man is Ernesto, a 60-year old photographer and trekking guide who owns a lodge beside Cuicocha. So we hired him. Alas, the weather wasn’t kind to us. Like most of Ecuador’s volcanoes, Cotacachi has a 4WD track up to 4000m to cut out a lot of the hard work. The mountain was clear when we started hiking at 6am, but it soon clouded over and we were in the thick of it. The wind was howling, and visibility so poor that even Ernesto was having difficulty finding the route. He said that the route changed last year, when a 7.8-magnitude earthquake caused rockfall that altered the shape of the mountain – echoes of the Hillary Step on Everest. It wasn’t wind, mist or earthquakes that stopped us on Cotacachi, but verglas – a thin layer of ice coating the rocks. This ice is treacherous. Slips are common, particularly on descent, but unlike thicker ice, verglas provides no means of arresting a fall. Cotacachi’s higher slopes are a steep scramble up black rocks. We reached 4700m, around an hour from the summit. Our guide Javier thought we could climb higher safely, but descending in those conditions would be too dangerous. This was my third visit to Ecuador. I’ve climbed a dozen or so mountains, but this was the first time I haven’t reached the summit. I was due some bad luck sooner or later, so I didn’t mind. The next day we followed a more common acclimatisation programme. We met up with Pablo, a cyclist and trekking guide who will be our support for the bike ride. Pablo drove us up to the car park at 4500m on Cotopaxi, and we hiked up to the mountain hut at 4800m. An active volcano, Cotopaxi has been closed for climbing since it erupted in 2015. We understand it will be reopening imminently, though, perhaps as soon as next week. Above the car park we saw mattresses waiting to be carried up, and the manager of the hut let us examine the new sleeping accommodation. It has improved massively since I climbed Cotopaxi in 2010. Then I had to sleep on a rickety old triple-deck platform housing many climbers, which rattled whenever anyone rolled over. Now there are proper bunks, and it will be much more comfortable. Yesterday we made an attempt on another rarely-climbed volcano, 4873m Sincholagua. The mountain can be seen from Quito and is very prominent from Cotopaxi. It’s surprising that it’s not climbed more often, but the reason could be one of access. 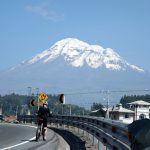 The road from Cotopaxi National Park up its flanks is blocked by a giant boulder, so it’s necessary to climb from much lower down, making for a long day. Pablo was determined to find a way round the boulder, and discovered a long farm track outside the park which led inside, to the other side of the boulder. It was rough as the proverbial badger’s arse (as we say in the UK), but Pablo is a 4WD aficionado, and thrived on the challenge of getting us as high as he could. This turned out to be 4200m, where steep grasslands merged into a rocky ridge which led up the mountain. For the majority of its ascent, Sincholagua is a hike, with a couple of short sections of easy scrambling. But the last 30m are technical. More technical than we anticipated, in fact. We really needed a climbing guide to get us up them. We were just a short stone’s throw from the very top, and the summit was there for the taking, but none of us possessed the necessary technical skills. We turned back defeated, leaving the summit for another day. On the way down, we discovered what we didn’t know before. The clouds that had covered the summit all day cleared, to reveal a sharp ice needle piercing the sky. The ice was on the opposite side from the route, so we hadn’t encountered it, but we must have got most of the way up the needle before accepting defeat. Sincholagua deserves a better reputation. It’s an enjoyable ascent. We should be well acclimatised for our sea to summit now. Whether my cycle legs are in shape is another matter. Pablo is the right man to help us out. 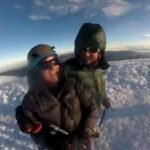 He is possibly one of only two people in the world to have completed a sea to summit on Cotopaxi. He has already given us a lot of useful advice, such as what to do when you are chased by an angry dog. Today he drove us from Quito to Guayaquil on the coast, the start of our adventure. We went via the road we will be taking up through the Andes, providing us with a final opportunity to change our minds. Unfortunately Edita won’t let me seize it. It was scary stuff that makes the Bealach na Ba on the North Coast 500 look like a gentle stroll through Hyde Park, wheeling a pram. I don’t even know if I’ll be capable of doing it. But chin up. We’ve just got to get on with the job and start pedalling. In five days it will be over, and the walking and climbing can begin. 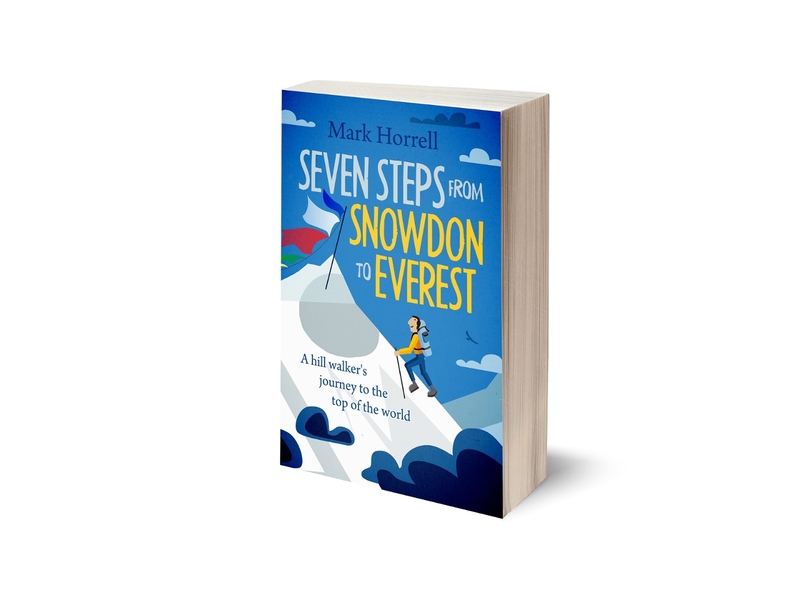 Come on then Mark, spill the beans what do you do if your chased by an angry dog? Hope you both have a wonderful journey.